Attorneys for the family of Stephon Clark have filed a wrongful death lawsuit against Sacramento Police Officers Terrance Mercadal and Jared Robinet, as well as the City of Sacramento, alleging the officers racially profiled and used excessive force in fatally shooting the unarmed, African-American father of two. 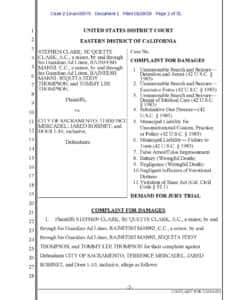 The complaint, filed in U.S. District Court Eastern District of California on behalf of Stephon’s two sons, his parents and his grandparents, seeks to hold the officers and the city accountable for violating various civil rights under federal law as well as the California Bane Act that resulted in the execution of decedent, Stephon Clark. Plaintiffs are represented by Brian Panish of Panish Shea & Boyle LLP, Dale K. Galipo and Eric Valenzuela of The Law Offices of Dale K. Galipo, and Ben Crump of Ben Crump Law, PLLC.